Atwood Primary School students now have the opportunity to study coding. At the same time, students are learning to code, they simultaneously write code to control some educational robots. Edison, the official name of the robot, is a small mobile box-like device which performs coded instructions created by the students. In order to offer the program to a maximum number of students, sessions for selected pull-out students take place over a four week period. 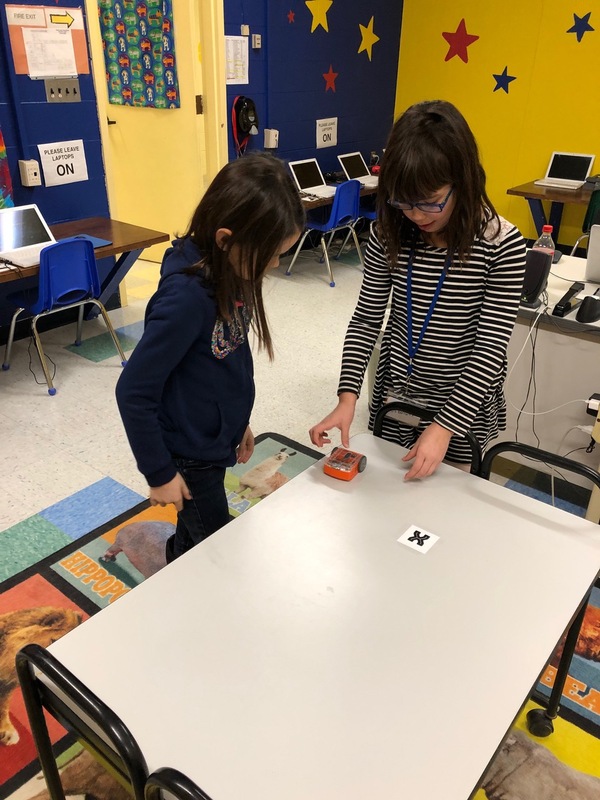 In this manner, new students are introduced to robotics and coding every month. Our first class to participate was the 2nd grade. After winter break, pull-out sessions for 1st-grade students will also begin. The idea for the program was suggested by Rob Perks, Atwood Primary Computer Integration Assistant. Jennifer McGee, Atwood Principal highly supported the program, and Ethan Pullen, an RSU18 alumni and Colby College computer science student, worked with Mr. Perks to formulate the four rotating lessons for both first and second grade students. The Edison robot is a very simple device with two wheels and is LEGO compatible, meaning LEGO pieces can be attached to the robot to create something entirely new. Edison can go forward, backward, turn left or right, blink LEDs, or play a musical melody. The robot can respond and take cues from different input sources such as flashlight, infra-red, and sound. Although the Edison units can be combined to create more complex devices, this option probably will not be utilized at the primary level. The robot program currently has four Edison units at a cost of $48.00 each. The software entitled EdBlocks was free, and progresses through three levels of complexity, allowing the computer language to grow with the students’ abilities. Mr. Perks is already looking to expand the program in the future.